I’ve been re-reading an incredible book called “If Disney ran your hospital: 9 ½ things you’d do differently” by Fred Lee. Although it was published 10 years ago and is about human medicine, the messages contained in the book are highly relevant to modern veterinary practice as well. It might be tempting to dismiss correlations between veterinary hospitals and Disney resorts as being far-fetched or simplistic. I disagree. While I’m not suggesting that everything that Disney does would work in our profession, at a high level, their focus on customer (“guest”) and employee (“cast member”) satisfaction is laudable. The first thing Disney would do differently if they ran your hospital would be to redefine your competition. Everyone who works in your hospital needs to realize that your competition ISN’T simply the veterinarians within your local area: your competition is anyone your clients compare you to. People judge quality by their perceptions, which are subjective and are affected by their entire experience in your hospital. This means that your clients who have been to Disney World or shopped at Amazon.com or ridden on Uber are comparing you to them. Our clients have been spoiled by world-class service and convenience from these brands, and there’s no reason you can’t do the same. 60% of purchases on Amazon.com are made on a mobile device. Why are many practices losing pharmacy revenue and profits to online providers DESPITE having lower prices? 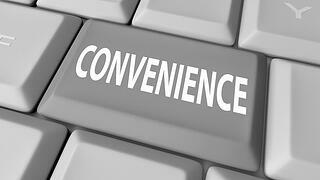 Convenience is probably the biggest reason, though there are others. As time goes by and the availability and quality of virtual shopping improves, clients want to do as much as possible online. They’d really rather NOT pick up the phone if they don’t have to, and having a medication refilled is something that shouldn’t require a phone call (or two if a doctor has to be part of the equation) and a trip to your office. If that’s the “deal” you’re offering your overworked, busy clients, you’re going to lose business to online providers where the prescription just showed up in the mail with auto-refill that guarantees you’ll never be re-filling that prescription again. Remember, it’s no accident that grocery stores have pharmacies and that they are way in the back (near the milk! ): they know you probably have other things you need to pick up while there and the store’s location is maximally convenient. Can you say the same about your veterinary hospital?